Happy Sunday! Sharing a Summer card on a rainy winter day! 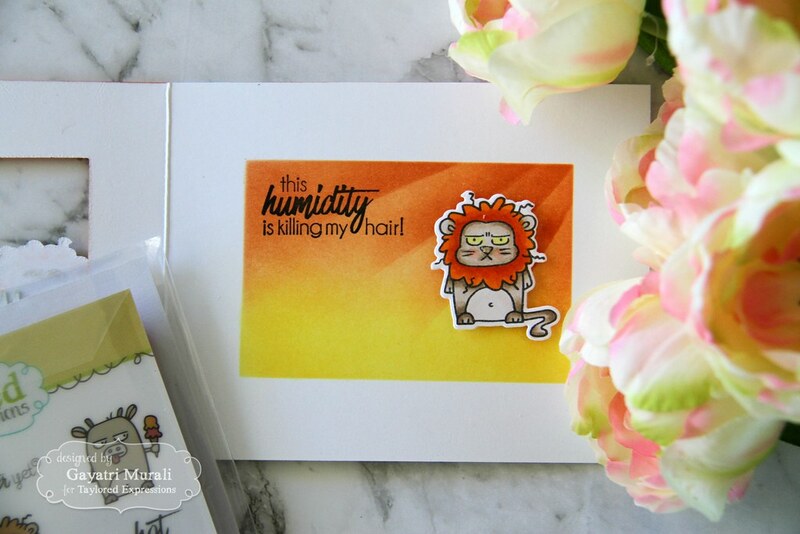 I made this card using Taylored Expressions Summer Grumplings stamp set. 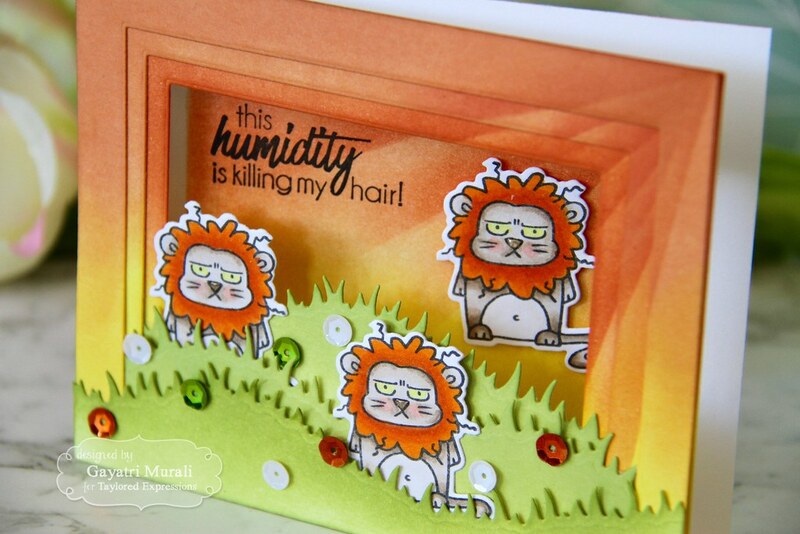 I started with stamping, copic colouring and die cut three lion images from Summer Grumplings stamp set. Then I die cut three of Grassy Hills borders and sponged them with Granny Smith TE dye inks. On one of the Grassy Hills border die cut I also sponged Peapod TE dye ink to add depth. To create the background, I die cut the card front and two white panels with three consecutive stitched rectangle dies from Stitched Rectangle Stacklet dies. For the card front, I used the smallest of the three and the other two dies on the card panels each. I used Lemon Meringue and Candy Corn TE dye ink to sponge both the card panels. Then I temporarily adhered the card front shut and sponged the same inks on the card front. This will give a square sponged area inside the card. I adhered the two panels on the card temporarily and used masking paper to adhere and sponge Pumpkin TE dye ink to get sun ray effect from the top right corner of the card front. 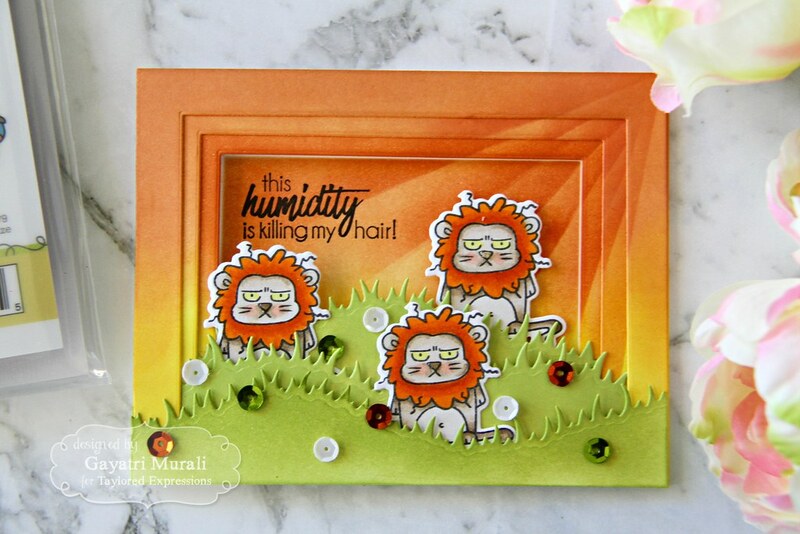 I removed the two panels, adhered the Grassy Hills border die cuts on top of the two panels as well as the card fronts. The excess is trimmed off. Now I adhered both the panels on the card front using tape adhesives. Using MISTI I stamped the sentiment on the inside of the card using Oreo TE hybrid ink. 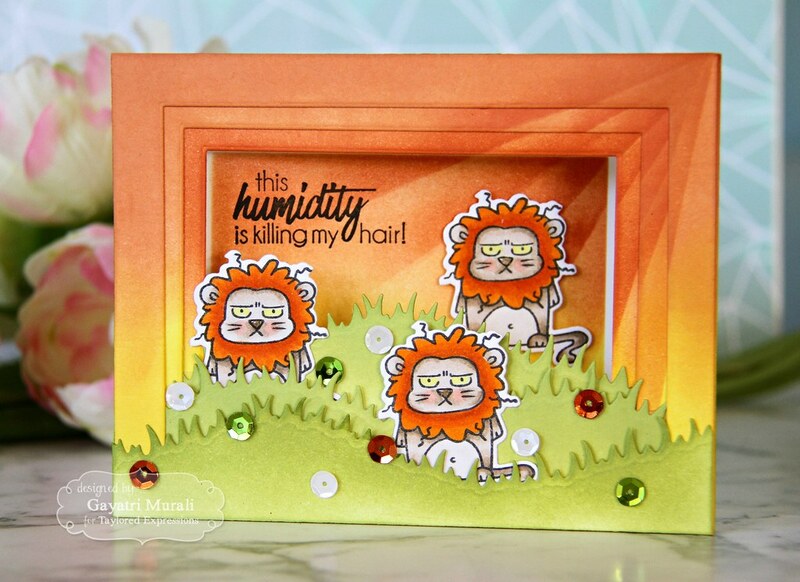 Then randomly adhered the lion images on the grassy hills border dies along with sequins from Rainbow Bright sequins collections. Love the staggered effect by layering the negative die cut panels. It give layers, depth and dimension to the card. All the supplies used to make this card are listed below. Yes, plenty of work but worth the result. Thanks Dawn! Thanks for your comment, Carol! Made me chuckle. Grumpy cat lol!